The original for making music - now completely free. Making music with Music Maker has always been surprizingly easy. And now it's even free! 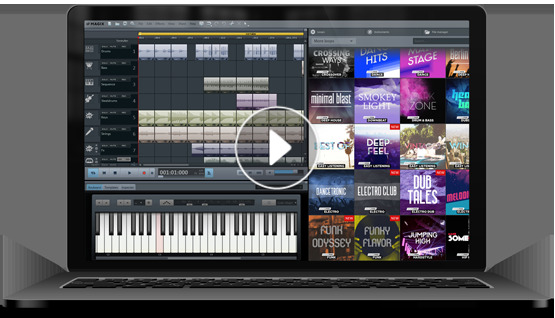 Produce bright party hymns, massive trap or heavy hip hop beats with Music Maker or with one of the popular editions. Produce music with software instruments - every instrument has its own sound. Every sound has a different story and you get to decide how that story is told. Let yourself be carried away, be inspired by the exclusive instruments in Music Maker. Easily create or arrange your own music. Produce accurate, customized sheet music, and create music that sounds great. Listen to the song while you follow the notes on your screen. Then edit the notation and the sound of the music. Audio Merge Expert is able to merge separate audio files into one big file without quality loss. It allows you to input audio files of the same/different formats and everything will be done in a split second. RealTime Composer is a very simple program of making your own soundspaces. Fill your sound palette with musical fragments and sound loops. Put palette sounds into the sound space cells. MixPad is multitrack mixing software designed for professional audio production. It lets you load or record audio clips and mix them together. You can place them at different times, adjust volume, pan the audio or fade in or out. GuitarTab Maestro is a perfect tool for any guitar player or band. Offering easy composing, transcribing and notation features, this guitar tab software is made for guitar professionals, music teachers and enthusiasts learning how to play guitar. Play Blu-ray movies/Folder/ISO image files and any videos on Mac.